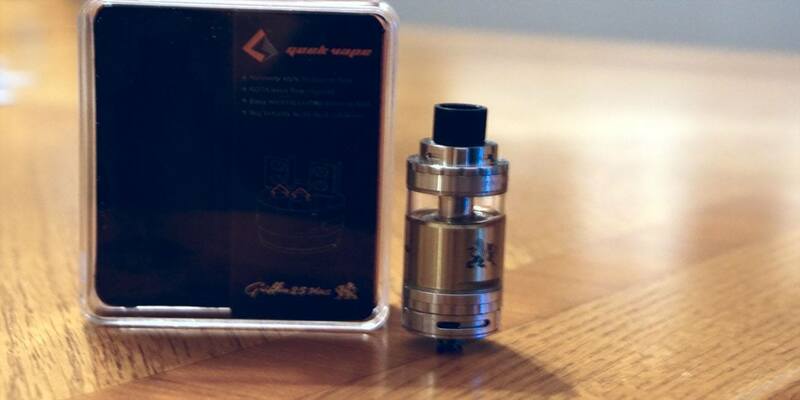 Geekvape Griffin 25 Plus RTA Review - Daily Vaping Deals & The Best Vape Product Reviews at Vaping Cheap! Geekvape has been releasing excellent products over the past year, and is well known for their original Griffin RTA. Last year, the Geekvape Griffin RTA was one of the most, if not the most popular RTA on the market. Since many new atomizers are being released with larger diameters, it was only a matter of time before Geekvape released their own. During this year, they released the Griffin 25 and Griffin 25 Mini RTAs. Both were also highly rated, but many people really loved the Griffin 25. Now, Geekvape has released their new Griffin 25 Plus RTA offering some new features, but keeping a relatively familiar design. Firstly, I would like to thank Heaven Gifts for sending this product my way for review. I will go over many different aspects of the new Geekvape Griffin 25 Plus RTA, and conclude by telling you whether or not I recommend this new RTA! Click Here to Check Out the Griffin 25 Plus RTA! Upon first receiving the Geekvape Griffin 25 Plus RTA, I immediately noticed the familiar packaging that Geekvape has used with almost, if not all of their atomizers. The packaging itself had some scratches, but it was not severely damaged in any way. I do want to mention the scratches though, as this is not the first time I have experienced this issue with Geekvape packaging. It is not a deal breaker by any means, but still worth mentioning. What I noticed immediately about the Griffin 25 Plus RTA is the size. This is definitely a huge tank, and much bigger than most tanks I currently own. The size is pretty much the same as the original Griffin 25 RTA. I did not have one to compare it to, but from what I remember, they do seem to be the same size overall. If there is any difference, it is probably very minor. A huge pro to this RTA right from the beginning, is that this atomizer includes both the top airflow cap, and a top cap with no top airflow. This is definitely a huge pro, because the original Griffin 25 RTA had two different options for each top design, which I thought was very unnecessary. However, the top section that does not feature top airflow is constructed of what seems to be delrin. It is not stainless steel like the top section with top airflow, which might be a con to some people. Personally, I did not find this to be a con, and actually prefer delrin top sections over stainless steel. It is a huge pro regardless though that they included both top sections, and not have it as a separate purchase. You do receive an extra glass tank section as well, which is another huge pro. I know many people who break their first glass tank section relatively quick, so having an extra one is certainly a pro. In addition, you do receive a ceramic single coil adapter. This is again another huge pro, as it gives the people who purchase this atomizer the option of running single coil builds. I honestly did not care to use this single coil adapter, as I do prefer dual coil builds, especially in an RTA like this. You do receive a bag of spares with o-rings and screws alongside an orange multi-purpose screwdriver similar to the one you get with other Geekvape atomizers or Wotofo atomizers. I do like the multi-purpose tool, as it is much better, in my opinion that the standard blue screwdriver. Upon taking the tank apart, it reveals the huge building deck. The Griffin 25 Plus does feature a two post velocity styled build deck, so you already know building and installing coils in this atomizer will be easy. However, the size of this build deck is really big. From what I remember, it does look bigger than the original Griffin 25 RTA. I am not sure exactly how much bigger though. Also, I noticed immediately the Kennedy styled airflow. Personally, I am a huge fan of the Kennedy and Kennedy styled airflow, so this was definitely a huge pro for me. You can check out my review right here for the Kennedy 24 RDA, if you are interested to see my thoughts exactly on this style of airflow and atomizer! You can also click the link provided down below! Click Here to Check Out the Kennedy 24 RDA Review! Also, the wicking channels are completely different. Unlike the Griffin and Griffin 25 RTA, the e-liquid feeds to a much bigger juice flow hole, to the cotton and then into the coils. This is certainly different from what I am used to in an RTA, but seemed easy enough to wick. Everything came apart relatively easy, and the overall design is similar to the original Griffin 25 RTA. The major differences from what I saw was the airflow, wicking, and the size of the build deck. All of the threads on the Geekvape Griffin 25 Plus RTA were smooth. I did not notice any issues with the threading or screws. A huge con for me though with this product was that the Griffin 25 Plus RTA came with a decent amount of machine oil. I really dislike when an atomizer comes soaked in machine oil, as it takes even longer to really get it ready to be vaped. However, one wash with soap and water, and the Griffin 25 Plus was good to go. My overall first impressions were positive! This was certainly a familiar yet different Griffin atomizer. As mentioned previously, the Geekvape Griffin 25 Plus RTA features a two post velocity styled build deck. I personally love these style of build deck, because it just makes building and installing coils so much easier in comparison to most other decks. In addition, the Griffin 25 Plus had a relatively large build deck as well, making larger builds fit with ease. 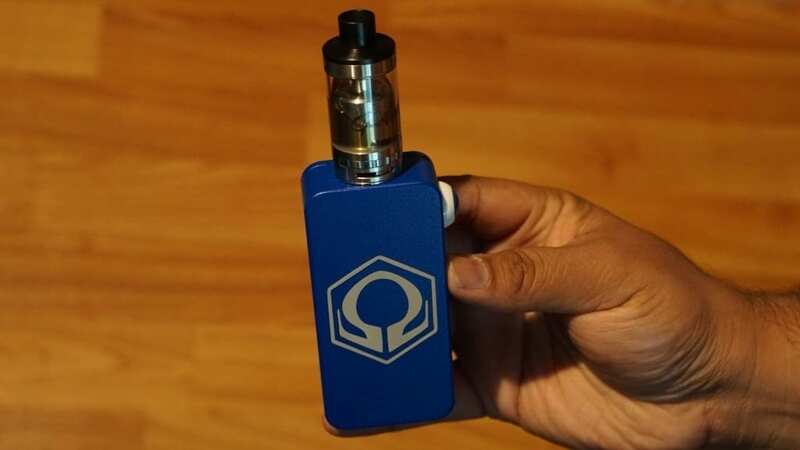 Even if you are inexperienced with building, it really isn’t hard to build on this atomizer with this style of build deck. If you are experienced with building, then you will literally have no issues at all with building on this atomizer. You can easily fit 3mm Fused Clapton Coils in the Griffin 25 Plus. However, I do prefer slightly smaller diameter coils, such as 2.5mm in diameter. The post screws are excellent and much better than the original Griffin RTA screws. The post holes are also very large, so thicker builds will have no issue in here either. Wicking the Griffin 25 Plus RTA is also very easy, and honestly I think it is easier than all of the Griffin atomizers available. I literally wick this atomizer just like an RDA. If you are used to wicking RDAs, then you will have no trouble with wicking. However, if you are not experienced with wicking an RDA, just be sure to cover up the holes with cotton in the wicking channel. Once the holes are covered, you do not really have to worry about anything from my experience. The wicking holes are extremely large, and I was certainly happy with this change, because the past Griffin atomizers had much smaller juice flow and channels. Overall, building and wicking the Geekvape Griffin 25 RTA is extremely easy. No matter if you are experienced or inexperienced, you will have little to no issues with this atomizer in regards to wicking and building! The overall performance of the Geekvape Griffin 25 Plus RTA is excellent. This is definitely a high performing RTA! My favorite build in this RTA was a dual Fused Clapton Coil build, which had a resistance of 0.2 ohm. I would typically vape this build between 65w and 80w. 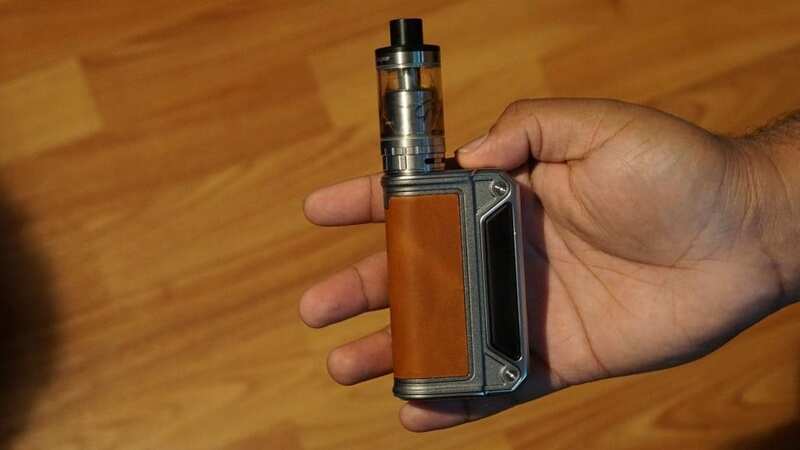 At 80w, it provided me with a warmer vape, which is something I definitely prefer. I did try other coil builds in this tank such as normal round wire builds, which performed just fine as well. However, I do think that this tank was meant for larger builds, and you can certainly tell with its huge diameter build deck! What I noticed immediately when I first vaped this tank was the vapor production! This tank provides you with excellent vapor production overall. This, of course will depend on the wattage, build and airflow setting. I was certainly impressed by the vapor production, and it was definitely on par with some of the RDAs I currently own. The flavor was also really good out of the Griffin 25 Plus RTA. I already knew that the flavor would be excellent with the Kennedy styled airflow this tank features, and it certainly did not disappoint! The flavor is definitely better than the original Griffin 25 RTA, and on par with or slightly better than the original Griffin RTA. The original 22mm Griffin RTA is one of my go to RTAs, so I know the flavor output of that tank very well. Honestly, I could rave on and on about how good the flavor was out of this tank! Even with all of its available airflow, the flavor was absolutely incredible. Speaking about airflow, this tank has tons of it! With the bottom and top airflow fully open, you get a very airy draw, certainly too airy for me. I prefer a much more restrictive lung hit in comparison, so with it fully wide open, it just wasn’t for me. However, I did like closing the bottom airflow to about half way, and the top airflow completely closed to find a draw that would suit my vaping preference. I did try different airflow settings to find my sweet spot, but honestly every other settings was either way too airy or slightly too restrictive. The airflow control system is designed to click into place, which is another huge pro. I hate airflow control systems that easily moves, so I was certainly glad that Geekvape decided to go with this design. The top airflow kind of worked the same way, but did not really click how the bottom airflow would when being adjusted. In addition, I preferred to use the top section without the top airflow since I did not really utilize the top airflow much. If you are looking for a very airy tank to cloud chase, this may just be a tank for you. For me though, there is just too much airflow. The flavor is still solid regardless though, so I was definitely satisfied in that regard. Both of the top section drip tips were comfortable to use. However, you cannot use your own drip tip with the delrin top section, but you can with the stainless steel top section. This is definitely something to note if you like to use your own customized drip tips. Either top section does not support 510 drip tips, which can also be seen as a con. 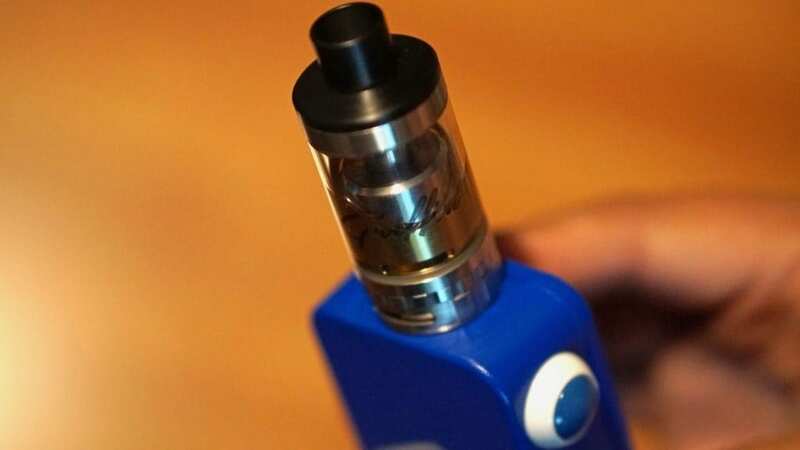 What I noticed though when using the Griffin 25 Plus is that there would be some e-liquid around the bottom of the tank, right by the airflow control ring. I have no idea why this would happen, and this would happen with my other Griffin RTAs as well. I would’ve hoped that Geekvape addressed this issue, as I do recall many people complaining about this with their Griffin tanks. However, it was not a huge issue nor did it happen often. It happened the most when I would leave the tank on its side, or left it for some time with e-liquid left in the tank. It would also happen when I would keep this tank in my pocket. In addition, something else I noticed when vaping this tank is that the juice flow control is fairly stiff. Honestly, there were times where the juice flow control felt stuck, and it would not move. I would have to literally take apart the tank and put it back together for it to be able to adjust again. I have no idea why the juice flow control would work this way, and not sure if it is part of the design or not. Regardless, I am happy this feature is there, but definitely not happy with how it is working. Another thing I noticed with this tank, is that it really goes through e-liquid fast. It does keep up quite well with wicking, which is definitely a pro, but then again it plows through e-liquid. The e-liquid capacity is quite large, coming in at about 5ml, so it wasn’t too bad, but still it went through 5ml relatively quick. I could easily go through a full tank within an hour with on and off vaping with the previously mentioned build and wattage. Thankfully, filling this tank is really easy, and the top fill of this tank is well done. The fill holes are extremely large, and probably the biggest I have ever seen with any tank. The threads for the top fill were really smooth, and just an easy to use top fill design overall. The performance of the Griffin 25 Plus RTA was excellent. However, there are some cons to be mentioned with this tank which we will get into next! The first con to be mentioned is the e-liquid that would seep out by the airflow control ring. I just dislike having e-liquid on my hands, especially when it happens when you are adjusting the airflow. Like said before, it did not happen very often, but often enough where I felt this was certainly a con. I have no idea as to why this issue would occur, and have tried multiple solutions, but nothing has seemed to work thus far. 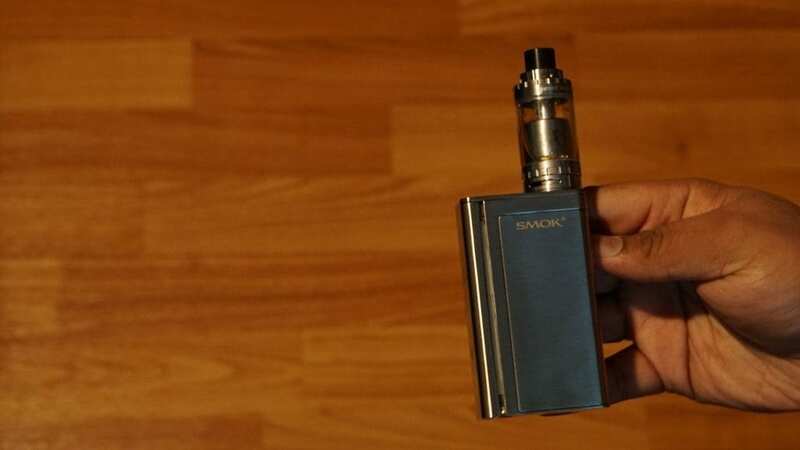 It is important to note that the e-liquid is not coming from the airflow control itself. The second con is the adjustable juice flow control. I have no idea why it is so difficult to close or open. It really takes some force at times for it to actually move where you want it to. This is definitely a con, as it should be much easier and smoother overall. The other Griffin RTAs that have this feature do not have this problem, so I have no idea why this tank would. The next con is subjective, and it is the amount of airflow. This tank is very airy, and just way too airy for me. In addition, when you close off the airflow under half way, it tends to whistle every single time you take a draw. This is certainly annoying, and would have me just open up the airflow just to avoid this sound. Another subjective con is that the Griffin 25 Plus RTA goes through e-liquid very quickly. Yes it does wick very well, but it does also drink e-liquid very fast. If you want a tank that does not go through e-liquid quickly, then this RTA is not for you. This tank does not support standard 510 drip tips. This is yet another subjective con, but was not too much of a con for me, since I prefer wide bore delrin drip tips with my tanks. However, I know many vapers prefer using their own customized 510 drip tips, so this is something definitely worth mentioning. The next con is also subjective, which is that this tank is very big. If you do not like large tanks, then this is surely not a tank for you! Overall, this tank does have its cons, but it certainly does not take anything away from how great it performs, which leads me into my conclusion! In conclusion, the Geekvape Griffin 25 Plus RTA is a solid performing 25mm tank. To me, this tank is much better than the original Griffin 25 RTA. The newly featured Kennedy styled airflow really does make a huge difference in performance and flavor! In addition, this tank has excellent vapor production, and can surely compete with some of my RDAs! This tank offers tons of airflow, and includes two different top sections which is another huge improvement over the original. As said previously, this is certainly a high performing tank. The quality of this RTA is solid, and Geekvape has really done a great job with this new atomizer, giving you some of the most favorite features of some atomizers, and packing it into one single RTA. Even though there are some cons to this RTA, I still think this is currently one of the best on the market. Geekvape really has taken the Griffin RTA to the next level with all of these new features. Even when it comes down to wicking this atomizer, it is just that much easier than before. Overall, I do think the Griffin 25 Plus RTA is a solid option for many vapers, especially those looking for a bigger RTA that can fit larger builds. If you are a fan of the Griffin line of tanks, then I highly doubt you would be disappointed with this one. If you are looking for an RTA to cloud chase with, but want solid flavor as well, then this is a tank I definitely recommend! However, if you prefer a much more mellow vape, and a more restrictive lung hit, then this may not be an RTA for you. Hopefully this review has helped you with a future purchase! If you have any questions or comments, feel free to leave them down below! Thanks for reading!